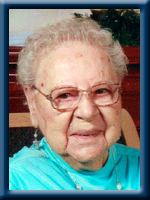 FRAIL – Lois Lenwood, 96, of Bridgewater, formerly of Westfield, Queens County, passed away peacefully in Rosedale Home for Special Care, New Germany on Tuesday, March 11, 2014. Born in Westfield, she was a daughter of the late Charles and Nellie Martin. Lois was a homemaker who enjoyed baking, sewing, knitting, embroidering and crocheting. She loved to read and play the organ. She was a member of the Westfield United Baptist Church. She will be fondly remembered by family and friends for taking pride in her appearance, her sense of humour and her warm smile. She is survived by her daughter Cecile Mansfield (Barry Gillis) of West Dalhousie, her grandchildren Christopher Peck (Ashley Campbell), Melissa Mansfield (Ryan West), Amanda Mansfield (Daniel Sparkman), her son in law Roger Pettipas of Bear River, several nieces and a nephew. She was predeceased by her husband Cecil, her daughter Ferne Pettipas, sisters Pearle Doane and Myrna Walker, her sons in law Carleton Mansfield and Carroll Peck. Please accept my condolences on the loss of your mom. You certainly have taken good care of her and made sure she got lots of enjoyment from her life. Lois was full of life and a very fashionable lady and will be missed. My thoughts go out to you as you say your final good byes to your mom. She lived to see many changes in the world around her. faithful to the end. May fond memories surround you and help you to move on with your life. enjoyed a few minutes of chatting whenever we met. Her kindness and her smile will remain in my memories, and I am glad to have known her during my years in the area. You and your family will be in my thoughts as you pass through this difficult time. Take comfort in knowing that she is at rest. I am thinking of you at this sad time. Keep all the good memories in your heart. They will be very comforting to you. I am so sorry to hear of the passing of your mom Cecile . I am thinking of you at this very sad time in your life . Hugs . My Thoughts and Prayres are with you. My heartfelt condolences are begin sent to you from here in Florida. Your Mom/Grandmother lived a full and wonderful live and I am sure you all of wonderful memories of her. God be with you at this time. To let you know we are thinking about you at this difficult time and that you are in our prayers. I’m thinking of you during these difficult days … I know you are sad to have said your final good-bye – she gave you life and loved you every day until her death. She was your mother, and you will miss her. Keep her close in your heart and remember the happy times with her. I’m sorry I can’t be with you on Tuesday, but I’ll have you in my thoughts and prayers. I never met your mother but you always spoke of her when we would meet now and then and how you looked after her. I am sure she appreciated everything you did for her. Take comfort in knowing that you were always there for her as she was always there for you. Thinking about you all as are all your friends and family. Take care. So sorry to hear about your loss of your Mom, I know that with all your friends and family support you will be able to remember the good times and be strong. So sorry to hear of your mom/grandmother’s passing. Our thought and prayers are with you and your family during this difficult time. sad time. We remember your Mom as a friendly caring Lady. I am sorry I can’t be with you tomorrow as I have an appt. but I want to let you know that I am certainly thinking of you all and this difficult time you are going through. Your mom was a jewel and she will be remembered by her grace and charm and her love for the Lord. My prayers and thoughts are with you all. The members and congregation of our church wish to extend our sincere sympathy to you and the family on the passing of your mom. Our prayers and thoughts are with you. Cecile and family: I want to tell you that your mom “Lois” will be miss so much by me. I grew so fond of her, she was a amazing lady that brightened up my day. We always talked and she told me many stories about herself and the people she loved. I will never forget her prayer and you are now in mine. My sincere sympathy to you. To the family of the late Lois Frail, I would like to convey a sincere expression of sympathy in your time of great sorrow. We were so sorry to hear of your Mothers’ passing. I have a lot of fond memories of visiting your Mum & Dad when they lived in Westfield. Our thoughts go out to you and the grandchildren at this sad time. Cecile, I was so pleased to have a few moments to chat with you at Mom’s memorial service in Bridgewater. I have so many memories of playing with you and Ferne when June and I would be visiting your grandparents who lived nextdoor to your family home in Westfield. Although Lois’s last years were challenging for her health wise, she was so fortunate to have your love and that of her grandchildren. My thoughts are with you all at this difficult time. Cecile and family,our thoughts of deep and sincere sympathy are with you at this time.